Grace’s women’s soccer team, built on a foundation of returners, is poised for a bounce-back year in 2018. 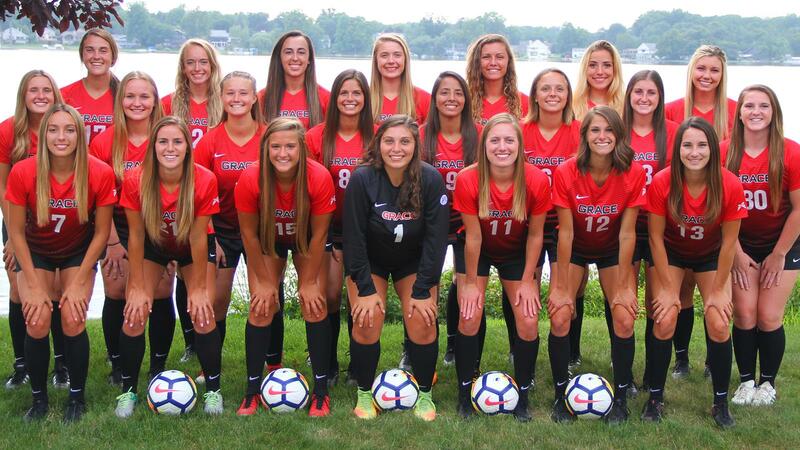 The Lady Lancers narrowly missed out on qualifying for a national tournament last fall, snapping a streak of six straight national appearances. That experience has left the squad hungry for a return trip to nationals in 2018, according to Grace head coach Michael Voss. Voss, the winningest coach in program history with 126 wins in 11 seasons, has recruited several talented newcomers to boost the team’s depth. Several of those players have the ability to start right away. “The ladies are ready. They come into this season with high expectations. They are resolved, and they know what they need to do to live out their goals,” Voss said. Grace excelled in possession last year. Voss was pleased with the team’s ability to control and move the ball against teams in 2017. As a team, Grace outshot the majority of its opponents and averaged 19 shots per game. The Lady Lancers’ finishing touch, however, was missing. Grace averaged just over one goal per game, less than that in Crossroads League play. Voss is confident that Grace’s possession will again be a strong point of the team. Grace’s midfield should be as deep and experienced as ever. Corinne Villalobos, Sacia Hanson, Kristen Bellinger, Allison Vroon, McKenna Cruz, Clair Snodgrass, Flavia Faria and Riley Koch give Voss a gluttony of combinations to play in the middle. They combined for 88 starts last year. Shelby Fort, Liz Van Wormer, and Jenni Phillips return as forwards. Each player brings pace and relentlessness in attack. The forwards will be joined by freshmen Baylei Peters and Natalie Williams. Peters, in particular, has looked dangerous in preseason so far, according to Voss. She is a crafty player with a knack for finishing shots. New midfielders in the rotation include Cassidy Wasson, Sarah Casteel, and Joana Schimmel. Schimmel returns to Grace’s team after playing as a freshman in 2016. Casteel and Wasson are smart, technical midfielders who can play multiple positions. Defensively, Grace will have to overcome the loss of center back Hannah Tkacz, who will miss the season due to injury. Returners Aubrey Feipel and Liz Aalbue give Grace experience, and Cruz and Bellinger also have played extensively in the back line. A pair of freshmen, Brooke Kohler and Anna Kuhl, will have a chance to play immediately as defenders. Kuhl provides a composed presence, and Kohler is confident on the ball and in distribution from the back. They will be anchored by freshman goalkeeper Bethany Blackwood, who has the unenviable task of replacing graduated All-American Abby Schue. Blackwood is an athletic keeper who has tremendous potential, according to Voss. “She wants to grow and be a great goalkeeper. She has a passion to work and train hard, and she will be a good player for us,” Voss said. To reach Grace’s collective potential, the Lady Lancers will need to maintain its level of possession. But Voss knows that Grace must put the ball in the back of the net more for the 2018 campaign to end in a national tournament.